Last month I explained what is needed to become regularly successful at hunting adult bucks, namely, dedication, accurate buck lore and new and improved hunting methods. 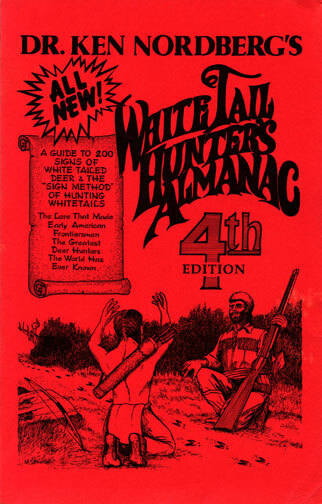 I then explained the numerous ways a buck hunter must be dedicated. This month, I'll tackle buck lore. 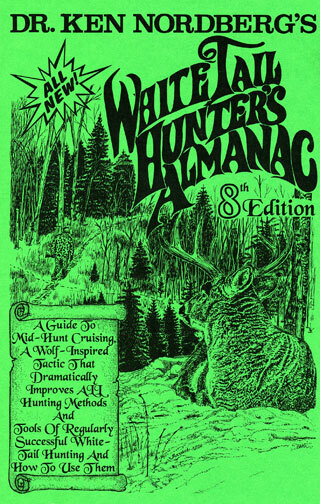 It's a huge subject (enough to fill nine Whitetail Hunters Almanacs). Some parts are more important than others. These you should learn first. The rest can be learned later. The last half of September is a particularly productive time to scout and select stand sites. By this time weather is fall-like (cool), triggering increased activity among whitetails which in turn insures there will be lots of fresh deer signs to look at while scouting. Most biting insects are done for the year, leaves begin falling and deer begin favoring many of the trails they will use right up until they migrate to wintering areas in late December. Much of what you learn from deer signs at this time will therefore be applicable to hunting in October, November and even December. 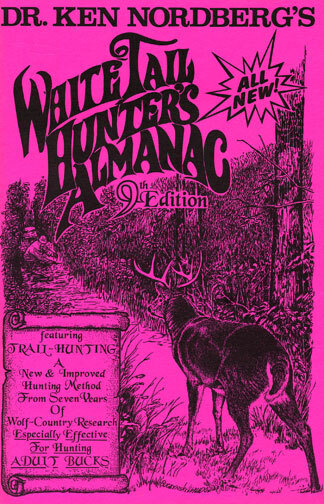 Whereas desirable quarries (certain big bucks) are sure to be alarmed by your scouting (also by hunters firing shotguns at small game such as grouse and woodcock), within 2-3 weeks most of those deer will resume normal, predictable activities in normal, predictable places (except maybe close to roads). Optimal odds for hunting success will thus be fully restored before hunting begins. 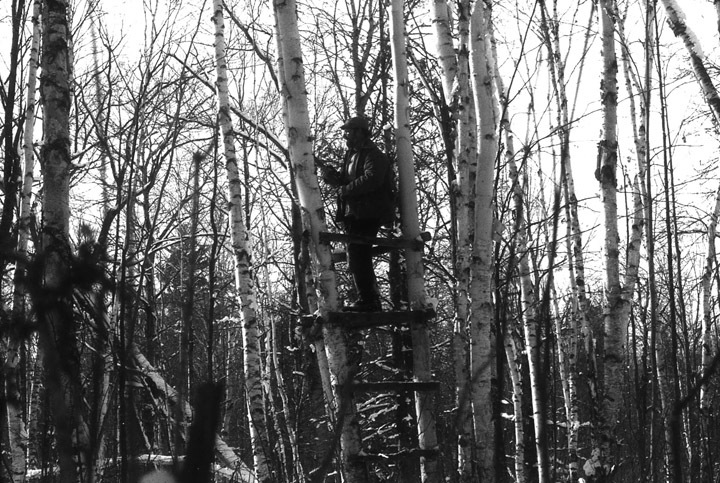 If you are thinking you don't need to scout or select stand sites because you plan to use the same stand site(s) you used last year, keep in mind today's experienced adult whitetails quickly discover, identify and thereafter treat stand sites discovered to be occupied or scented by humans with great caution, generally avoiding them. 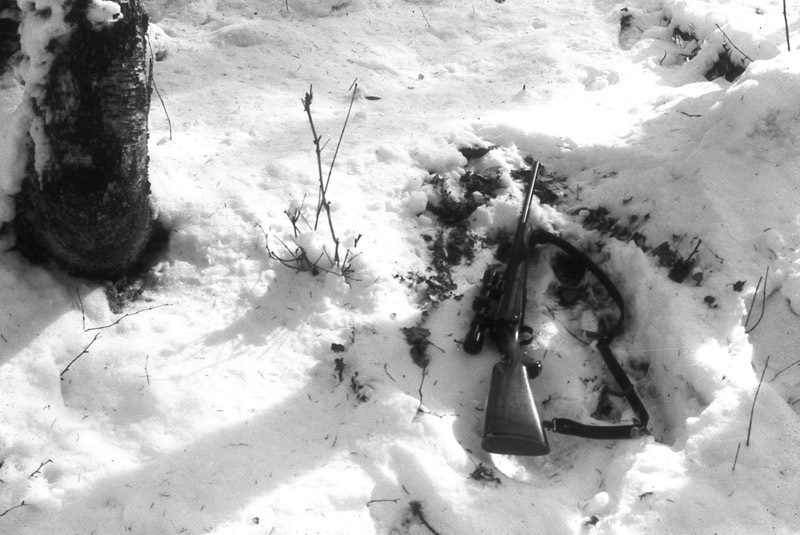 Though some well-chosen stand sites may be productive for several consecutive hunting seasons, most aren't. [Editorial Note: Doc's youngest son Ken — an exceptionally good hunter at locating stand sites — has had 2 stands where he took 5 bucks — year-after-year. Of course, since he kept harvesting the bucks that moved into the areas surrounding these 2 stand sites, these mature whitetail bucks were never able to learn about this deadly hunter. If you take a buck from a stand site, it is worth another try the following year. 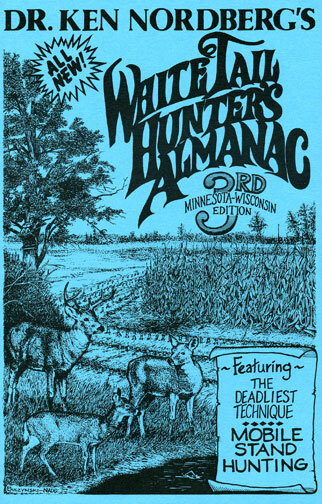 If you do not take a buck from a site that you have hunted 2 or more days last season, consider this — the whitetail deer in the area probably have learned to avoid that stand site.] The more a stand site is used during the course of one or more hunting seasons, the sooner it will become useless for hunting all but fawns and yearlings. Sure, last year's productive stand may prove productive again this year, but in the event it isn't, the smart hunter always begins each new hunting season with several new stand sites. To be productive for buck hunting, each new site must be selected with care and this requires pre-season scouting. While scouting, what should you look for? Deer tracks for one, especially very-recently-made, sharp-edged deer tracks. If the tracks were made by a walking deer (unalarmed), that deer lives nearby. It is almost certain that deer will be somewhere in the same vicinity on the day you begin hunting. 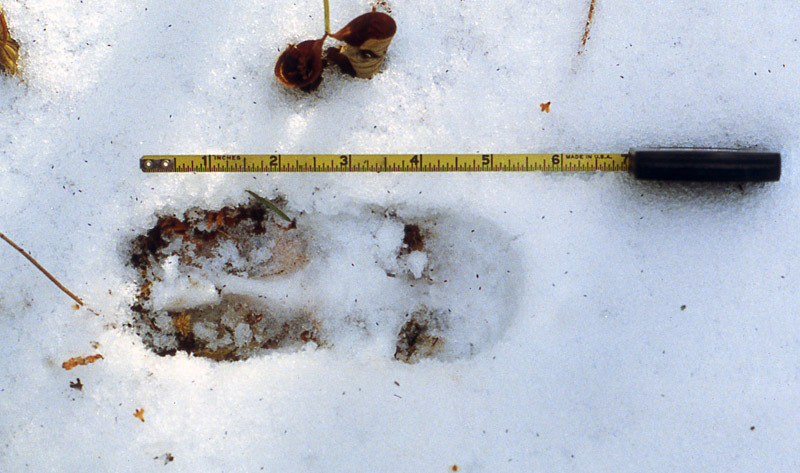 If the tracks are 3 to 4-1/2 inches long, tips through dewclaws (dewclaws are those two pointy things that stick down into soft soils or snow behind a whitetail's cloven hooves) or 2-3 inches long or less for hoof only, the deer that made those tracks was a fawn, yearling or adult doe living within the surrounding 80-125 acres. If the tracks are longer, the deer that them is a buck 2-1/2 to 6-1/2 years of age (few bucks live longer) living in the surrounding 0.5-1 square-mile. It will have antlers with 6-10 points. If the tracks are about six inches long, tips through dewclaws, or about four inches long for hooves only, the deer that made them is one of the largest bucks in your hunting area, almost certainly one for the wall. 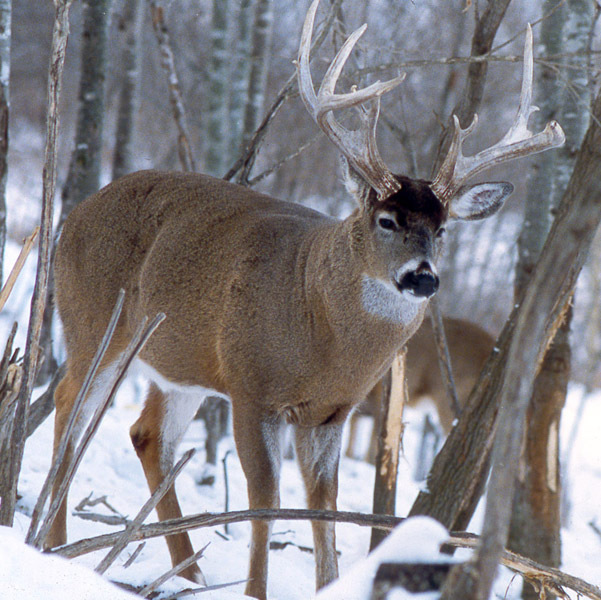 To key on bucks with impressive antlers only, select stand sites near trails or sites where you discover fresh tracks 5-1/2 to 6 inches long, tip through dewclaw or 3-1/2 to 4 inches long, hoof only. This track is right at the 4-1/2 inch threshold. This could be a large doe or a small buck. Look for tracks bigger than this. Doc highly recommends measuring tracks. Also, look for shiny droppings. Droppings are as reliable as tracks for providing great buck hunting. 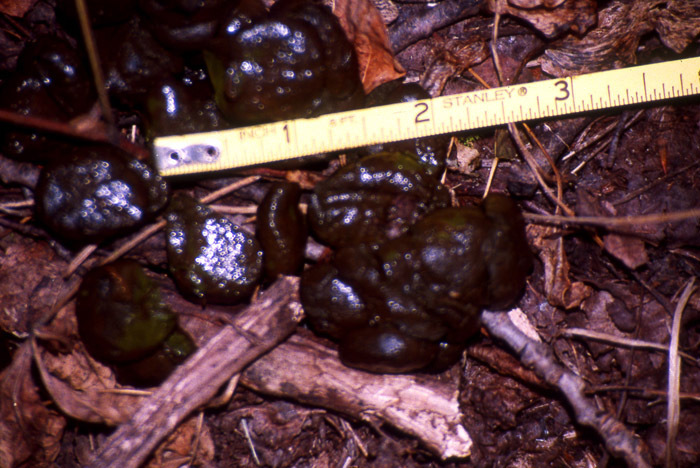 Droppings 1/4 to 1/2 inch in length (not including those little nubbins at the ends) were made by a fawn, yearling or doe. If longer, they were made by a buck 2-1/2 years of age or older. If 7/8th of an inch or longer, they were made by a potential trophy-class buck. Clumped droppings are generally buck droppings. In fall when leaves are falling and soil is dry, droppings are often the only measurable signs you will find while scouting. Never fear. 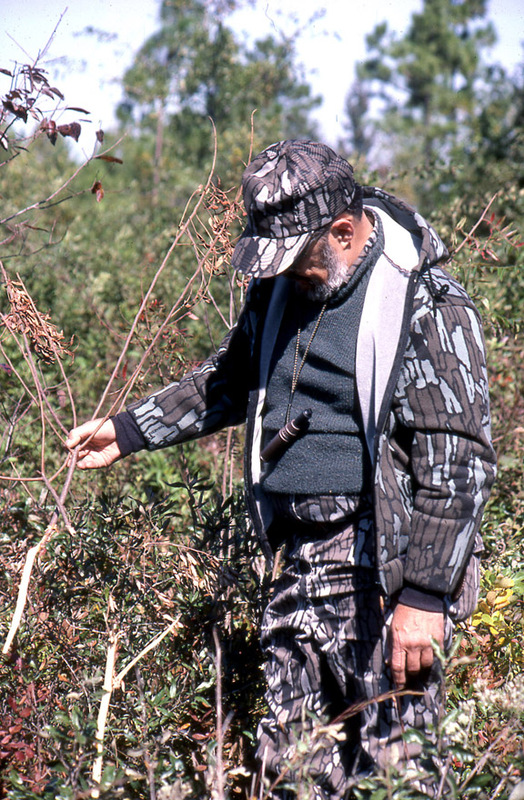 Stands near fresh adult-buck-sized droppings are as productive as stands near fresh adult-buck-sized tracks. Four key facts: black, shiny, (fresh), clumped, large pellets (buck). Doc highly recommends measuring droppings. If tracks or droppings are on a trail or in a certain area such as a bedding area (beds present) or feeding area (evidences of feeding present), chances are that deer will use that same trail or area early during the coming hunting season. Keep in mind, however, because of hunting, things will change within 2-3 days after you begin hunting. Obviously, this article doesn't emphasize beds, but here is a big buck's bed. Though unlikely to find ground scrapes in September, antler (velvet) rubs made during the first few days of September will be present. Most of these early rubs will be made on tree trunks or branches an inch or less in diameter regardless of the size of the buck. Such rubs won't tell you much about sizes of bucks (accompanying tracks or droppings will), but rubs made by bucks 2-1/2 years of age or older at this time are generally found within or near buck bedding areas (great stand sites if properly hunted). 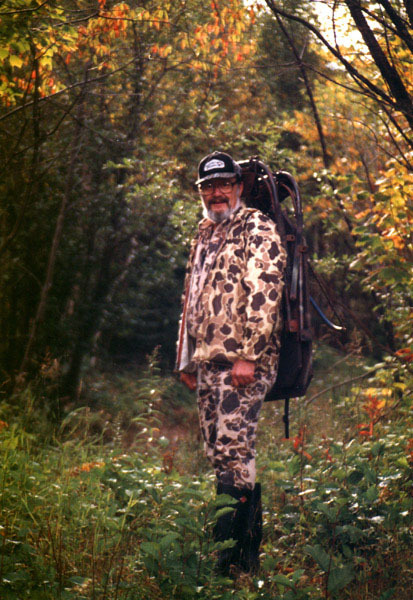 [Editor's note: Dr. Ken Nordberg calls buck bedding areas, "Buck Bedrooms." 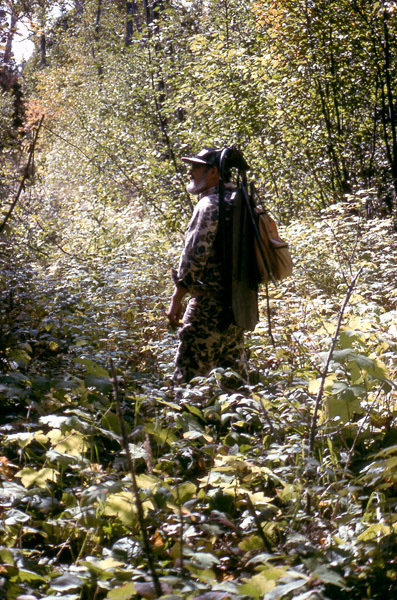 Over the last 30 years, he has noted many times, Buck Bedrooms are high risk areas to hunt. If not hunted properly you will chase your trophy-class buck out of his area for the remainder of the hunting season. In this case, "properly hunted" is a big topic not covered in this article.] 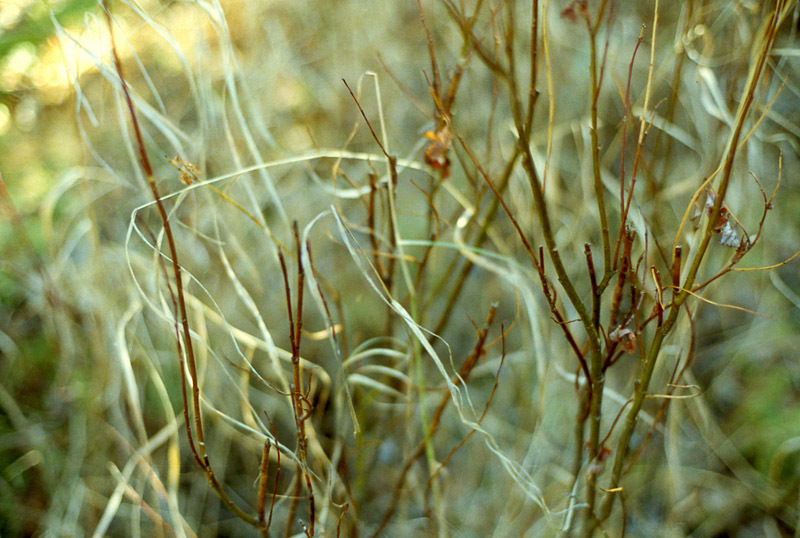 Rubs made by yearling bucks are typically found in doe feeding areas. 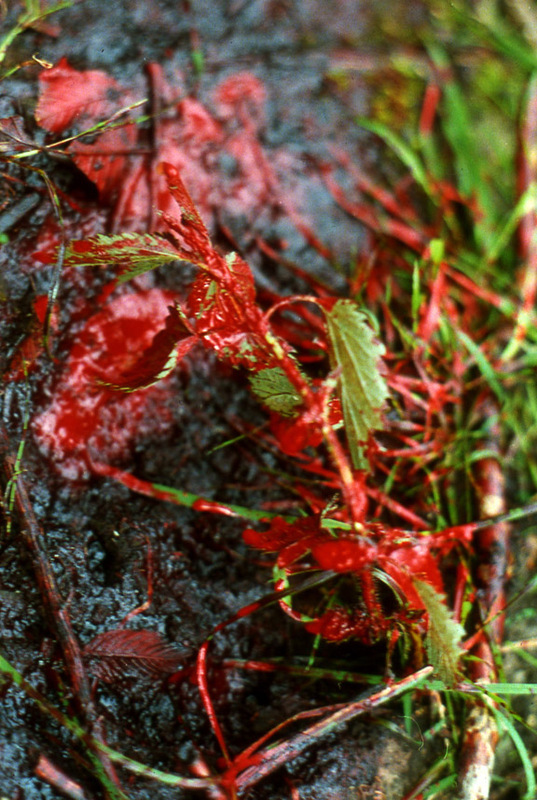 This is blood left on a freshly made whitetail buck's Velvet Rub. 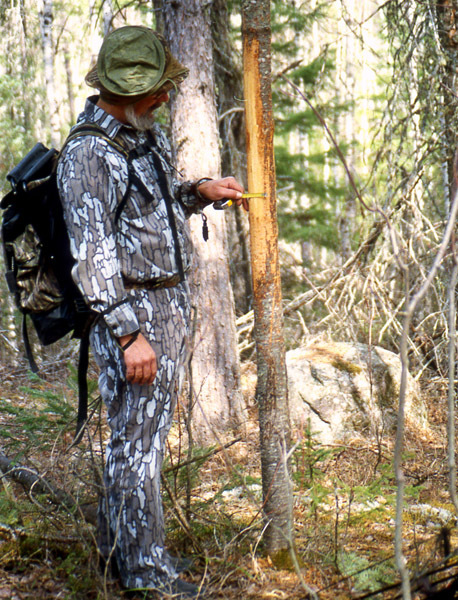 Doc looking at a small, early season antler rub. 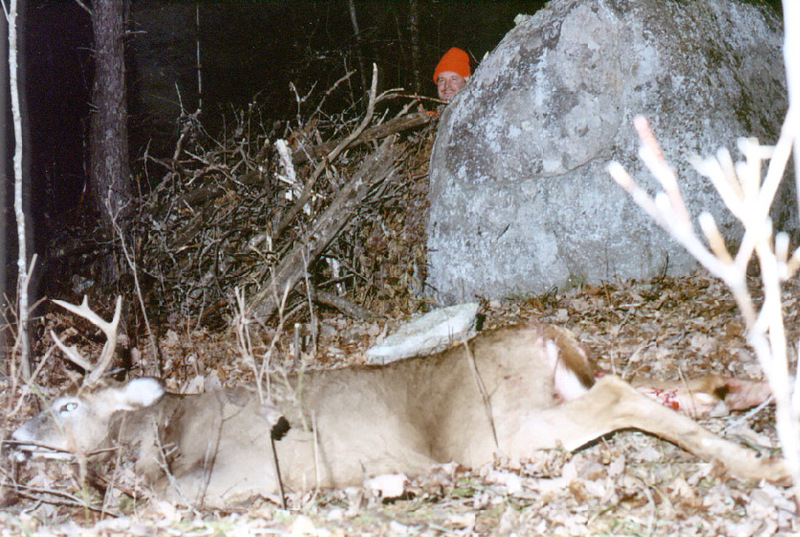 A typical early season antler rub. Even a large buck can start off with small saplings. That was an exciting antler rub made by a truly monster buck that we never, ever saw. A small buck can't do that! If you find no other deer signs, fresh adult-sized tracks and/or droppings are all you really need to select potentially productive stand sites for the first few days of the hunting season. After that you are going to need another means of determining where to hunt next (explained next month). When selecting stand sites, don't allow yourself to be overly influenced by abundant deer signs, well-worn deer trails for example, unless adult-buck-sized tracks and/or droppings are part of what you see. When hunting older bucks, except while breeding is in progress, large tracks and droppings take precedence over smaller tracks and droppings, no matter how abundant the smaller tracks and droppings may appear. Doc demonstrating what skylighting looks like. A big advantage of ground blinds — no skylighting. This worked. There was zero skylighting at this ground blind. When selecting a nearby stand site, make certain you won't be sky-lighted or snow-lighted by sitting only where you have a solid, natural background such as dense tree foliage, dense brush or a boulder behind you. 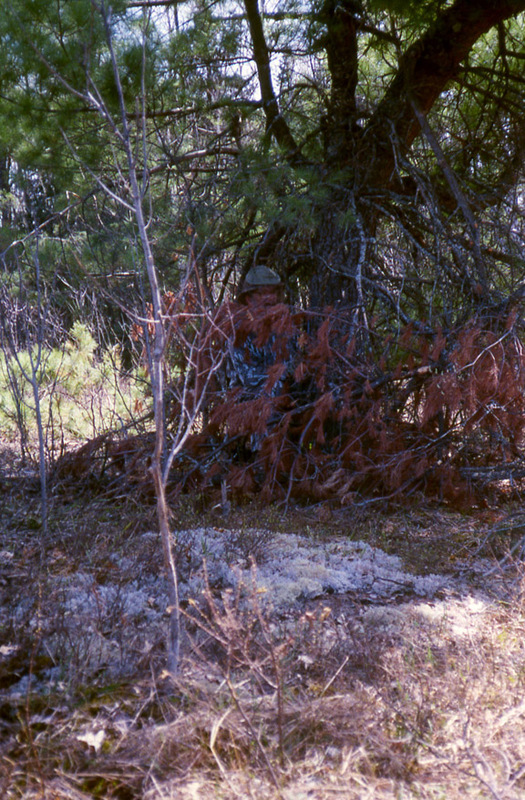 Also make certain you have some cover between you and where you expect to see a buck so you can raise your weapon without being readily spotted. Make certain you sit downwind or crosswind. Select a variety of stand sites that can be approached from different directions so you will be able to approach a stand from downwind or crosswind whatever the wind direction. While bow hunting between mid-September and mid-October or until the temperature regularly falls below freezing at night, key on feeding areas favored by antlered bucks. During this period, forest bucks will be feeding on grasses, clover, other greens and/or acorns where available. Most farm bucks will feeding on corn and/or soy beans. During morning and evening feeding cycles, antlered bucks of all ages will congregate in certain feeding areas to feed and then spar or battle to determine which of them is most dominant, thus earning the opportunity to do most of the breeding. Torn up patches of ground, much tracked by fighting bucks, and lots of buck-sized tracks and/or droppings are identifying signs of such feeding areas. 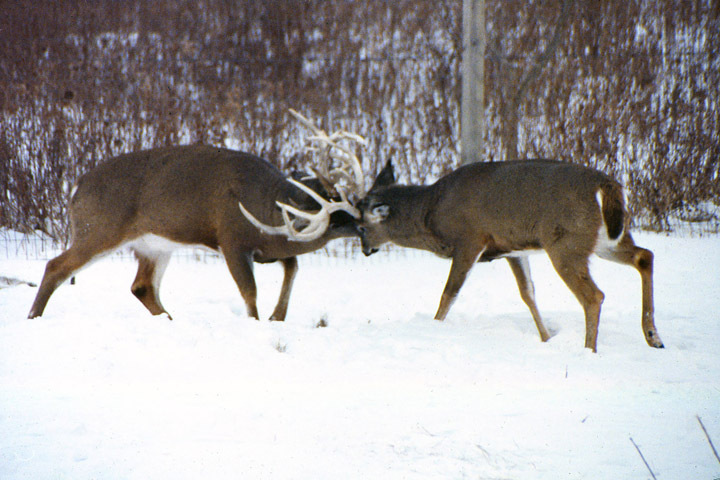 Doc's wife Jean photographed this epic buck battle in Wisconsin. During the last half of October and the first few days of November (unless it's unseasonably warm), all antlered bucks will begin staking out breeding areas (areas that include up to six doe ranges), marking them with antler rubs and ground scrapes. Within 3-7 days, however, via threat or battle the most dominant buck of each 1-2 square-mile area will evict all other antlered bucks from its breeding range (yearling bucks often sneak back). 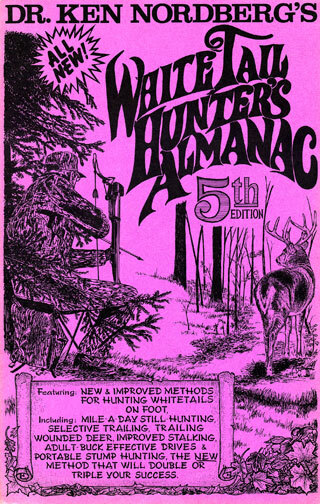 This 2-3 week period is the very best time to stand hunt near freshly made or renewed ground scrapes (a time when it pays to be a bow hunter). Beginning the second week in November, whitetails make the big switch in food from greens to woody browse (slender tips of various shrubs and tree saplings). Be ready for this. 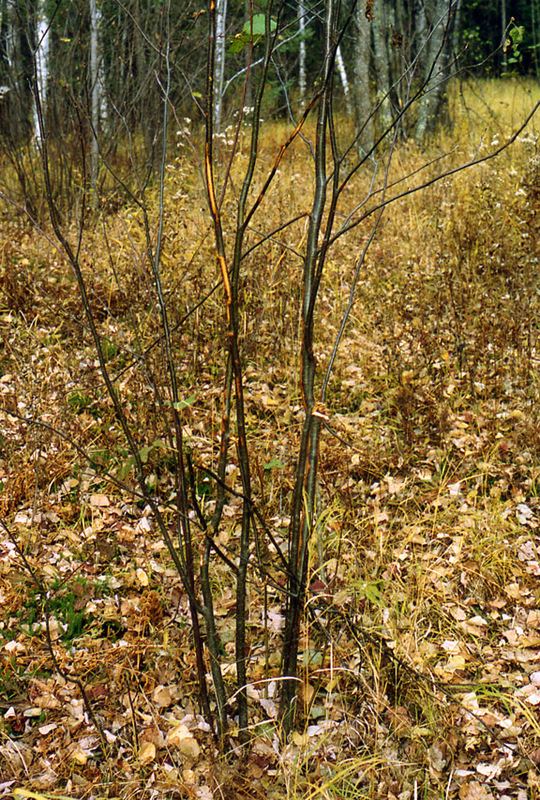 From this time until whitetails migrate to wintering areas, doe feeding areas will be characterized by lots of smaller off-trail tracks and droppings and lots of white tips of slender, nipped-off main stems and branches of various shrubs such as red osiers and mountain maples, most commonly found in damp or wet lowlands. Fresh adult-buck-sized tracks and droppings within or near the feeding area reveal a doe that feeds there is currently in estrus. Does not bred in November will experience estrus again 28 days later and 28 days later again if still not bred. For this reason buck hunters should continue keying on doe feeding areas until late December. Doc doing some September scouting. All of the above may seem easy to do, but can you identify a whitetail feeding area? Most deer hunters can't. If you can't, you're going to miss the excitement of hunting the best buck stand sites of the firearm deer hunting season. You'll probably end up hunting once productive sites at the wrong time — ground scrapes after November 5th, for example, or sites with a grand view, places smart old bucks avoid like poison during daylight hours. Don't give up, however. Keep your eyes peeled for the above listed signs of feeding areas. One day you'll suddenly halt and say to yourself, "Hey this is a browse area!" 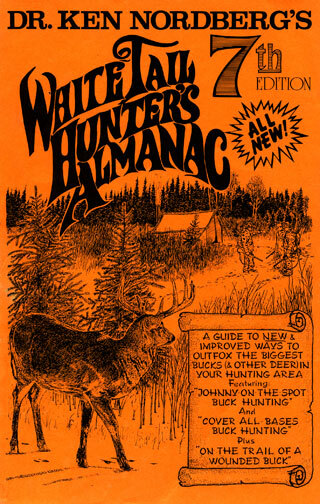 From that time on you'll be a much improved buck hunter.